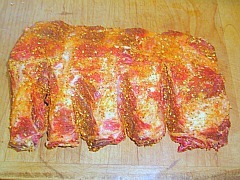 When you’re picking out your ribs, look for one that has a consistent layer of meat over the entire rack. If they’re much thicker at one end than the other, the thinner end will be done before the thicker end. You can cut the thinner end off and put them in the smoker an hour or so later or keep the thinner end away from the heat source. Don’t forget to remove the membrane from the backside of the ribs. Mix all spices together until thoroughly combined then apply an even coating of the rub on both sides of the ribs. Heat your smoker up to 200 to 225 degrees. Place the ribs in the smoking chamber and close the lid. Cooking time is going to be 4 to 5 hours if you keep the smoker temperature at or about 225 degrees. When the meat shrinks back exposing about ½ inch of the end of the bone, they should be about done. If you like bbq sauce it should be applied during the last ½ hour of cooking time or while the ribs are resting. Cut the rack into individual ribs and you’re good to go. Try this recipe and lets get smoky! Short Ribs ... a great recipe you might like to try. Prime Rib can be smoked to perfection. Beef Brisket is a great recipe for all occasions.